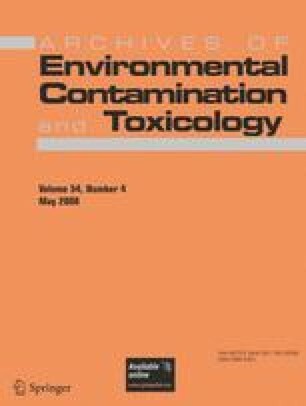 The toxicity of imidacloprid, a nicotinic mimic insecticide, to the aquatic invertebrates Chironomus tentans and Hyalella azteca, was first evaluated in static 96-hour tests using both technical material (99.2% pure) and Admire®, a commercially available formulated product (240 g a.i. L-1). The 96-h lethal concentration (LC)50 values for technical imidacloprid and Admire® were 65.43 and 17.44 μg/L, respectively, for H. azteca, and 5.75 and 5.40 μg/L, respectively, for C. tentans. Admire® was subsequently used in 28-day chronic tests with both species. Exposure scenarios consisted of a constant- and a pulse-exposure regime. The pulse exposure lasted for four days, after which time the animals were transferred to clean water for the remaining 24 days of the study. Assessments were made on both day 10 and day 28. In the C. tentans under constant exposure, larval growth on day 10 was significantly reduced at 3.57 μg/L imidacloprid, the lowest-observed-effect concentration (LOEC). The no-observed-effect concentration (NOEC) and LOEC for the 28-day exposure duration (adult survival and emergence) were 1.14 and greater than 1.14 μg/L, respectively; the associated LC50 and LC25 were 0.91 and 0.59 μg/L, respectively. The LOEC for the pulse treatment was greater than 3.47 μg/L, but the day 10 LC25 was 3.03 μg/L. In the H. azteca tests, the day 10 and 28 constant exposure, as well as the day 28 pulse exposure, LOEC (survival) values were similar at 11.95, 11.46, and 11.93 μg/L, respectively. The day 10 and 28 constant exposure effective concentration (EC)25s (dry weight) were also similar, at 6.22 and 8.72 μg/L, respectively, but were higher than the pulse-exposure day 10 LOEC and EC25 (dry weight) values of 3.53 and 2.22 μg/L, respectively. Overall, C. tentans was more sensitive to acute and chronic imidacloprid exposure, but less sensitive to a single pulse, than H. azteca. Chronic, low-level exposure to imidacloprid may therefore reduce invertebrate survival and growth, but organisms are able to recover from short-term pulse exposure to similar imidacloprid concentrations if the stressor is removed after four days. This study was funded by the Pesticide Science Fund (Environment Canada) and a University of Saskatchewan Toxicology Graduate Student Scholarship to S. Stoughton.